Let me tell you a little bit about speculoos and why you should love it if you aren’t already a huge admirerer and then we can talk muffins. Speculoos are Belgian cookies that have a distinctly brown sugar sweet and mildly spiced flavor. My first encounter with them was in a non-traditional cookie form studded with almonds from the Belgian owned Le Pain Quotidien restaurant group. These cookies were perfect. Nutty, sweet, spicey and super thin and cripsy. I loved them. I next enjoyed them in spreadable form over Belgian style liege waffles at Shaky Alibi. This spreadable cookie butter was irresistable. I can’t really describe it, it is more a magical thing that happens when you spread it over already delicious things like waffles or pancakes or toast. To really understand cookie butter you need to try it. One spoonful and you will be hooked. It is essentially speculoos cookies (biscuits) ground up into a peanut butter like texture. I love it in between two warm chocolate chip cookies or served with a scoop of vanilla ice cream. The possibilities of cookie butter are endless and their magical effect on the foods they are paired with is spectacular. 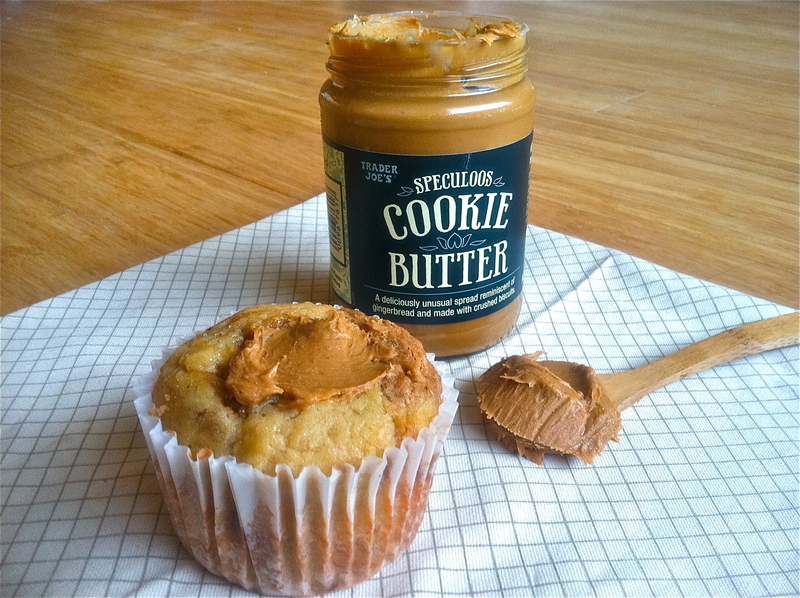 Now that I’ve waxed poetic about the glory of cookie butter let’s talk about muffins. I love banana muffins. I love ripe banana flavor and the tenderness it lends to muffins. Rather than make my go to banana muffin recipe, this time I decided to go for the gold and throw in some cookie butter. The result was a super sweet and slightly spiced (gingerbread-y) banana muffin. The speculoos and the banana flavors played nicely together creating a muffins that satisfied my love of banana and my constant desire for cookie butter. Were these muffins rich? Heck yeah so probably don’t make these every day, but definitely throw it into your banana muffin rotation every now and then. Put oven rack in middle position and preheat oven to 375°F. Line muffin cups with liners. Whisk together flour, baking powder, and salt in a bowl. Whisk together bananas, butter, sugar, egg and vanilla in a large bowl until combined well, then fold in flour mixture until flour is just moistened (do not overmix). Divide batter among lined muffin cups and add approx a tsp of cookie butter on top of each muffin (swirl with a tooth pick if desired). Bake until muffins are puffed and golden, about 25 minutes. Transfer muffins to a rack and cool slightly. Biscoff spread is my arch nemesis! Good to know about Speculoos, just in case 🙂 Question for you, what if I don’t like bananas but want to make these muffins? What would be good to use instead of the naner? Ahhhh! I just found the cookie butter at my local Trader Joe’s last week! I seriously jumped up and down…although I’m not exactly sure why since I’ve had Biscoff before and I know what it should taste like, buuuuuuuut it’s been a while since I’ve allowed such delicious temptations into my house….the last jar lasted about a week! Haha! These muffins are totally making me drool! I made some pancakes with Biscoff spread before and they were pretty amazing! Can’t wait to give these a try! Omg I love cookie butter!!! These look great. I already love Biscoff spread and now I need to head out to Trader Joe’s to give Speculoos a try!! Love your muffins this week. So creative and sound incredibly delicious! my immediate area TJ’s still is out of cookie butter but apparently others in the county (San Diego) are not…so I need to drive. B/c I love cookie butter and these look perfect! I tried to buy cookie butter at TJ’s this past weekend, but alas, they were fresh out. Pray for me that the shelves will be relined soon? I like the sound of banana + cookie butter, btw! I think it’s hilar that Anna is named “Banana Wonder” and doesn’t like bananas. Anywayyy, LOVE that dang spread. Can I make these as mini muffins? What would the cooking time be?